Nassau County is expanding H1N1 vaccination sites and will be offering H1N1 vaccines at Nassau County Senior Citizen sites. Health care professionals from the Department of Health have teamed with staff from the Department of Senior Citizen Affairs in their continuing effort to vaccinate the public against H1N1 influenza. In addition to the priority groups first recommended by the Centers for Disease Control and Prevention, now the general population can get vaccinated. “Our goal is to vaccinate all residents against H1N1 flu and this partnership will provide our seniors with as much access to vaccine as possible and help protect each and every resident of Nassau County,” said County Executive Edward Managano. Since influenza illness is unpredictable and we do not know the likelihood of a future wave of H1N1 influenza, I urge all seniors to get vaccinated. This vaccine is the best way to protect against the H1N1 virus, said Health Commissioner Dr. Maria Torroella Carney. Even though people 65 and older are less likely to be infected with 2009 H1N1 influenza, those that do become infected are at greater risk of having serious complications from their illness and there have been severe infections and deaths in every age group, including older people. People 65 years and older are now encouraged to seek vaccination against 2009 H1N1. 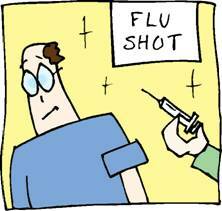 Influenza is expected to continue for months, caused by either 2009 H1N1 or seasonal flu viruses. This vaccine is the best way to protect against the 2009 H1N1 pandemic virus.